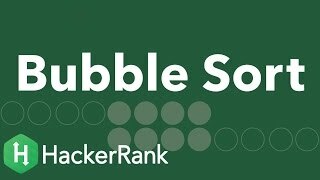 Check out the resources on the page's right side to learn more about bubble sort. The video tutorial is by Gayle Laakmann McDowell, author of the best-selling interview book Cracking the Coding Interview. Array is sorted in numSwaps swaps., where is the number of swaps that took place. First Element: firstElement, where is the first element in the sorted array. Last Element: lastElement, where is the last element in the sorted array. Hint: To complete this challenge, you must add a variable that keeps a running tally of all swaps that occur during execution. Array is sorted in 3 swaps. Complete the function countSwaps in the editor below. It should print the three lines required, then return. a: an array of integers . The first line contains an integer, , the size of the array . The second line contains space-separated integers . Array is sorted in 0 swaps. The array is already sorted, so swaps take place and we print the necessary three lines of output shown above. At this point the array is sorted and we print the necessary three lines of output shown above.